Although the entire premise of this blog and my research on Gun Culture 2.0 more generally is that self-defense and concealed carry have been become the core of American gun culture, I do recognize that self-defense and concealed carry have always been a part of American gun culture. Even in the late 18th and early 19th century we see handguns like the Durs Egg ladies flintlock and Allen and Thurber percussion cap “muff pistols,” designed to be carried in the cylinders of material that women used to keep their hands warm. In the mid-to-late-19th century, the Philadelphia Deringer was so widely copied that “derringer” became a popular (if misspelled) designation for many small, concealable pistols. 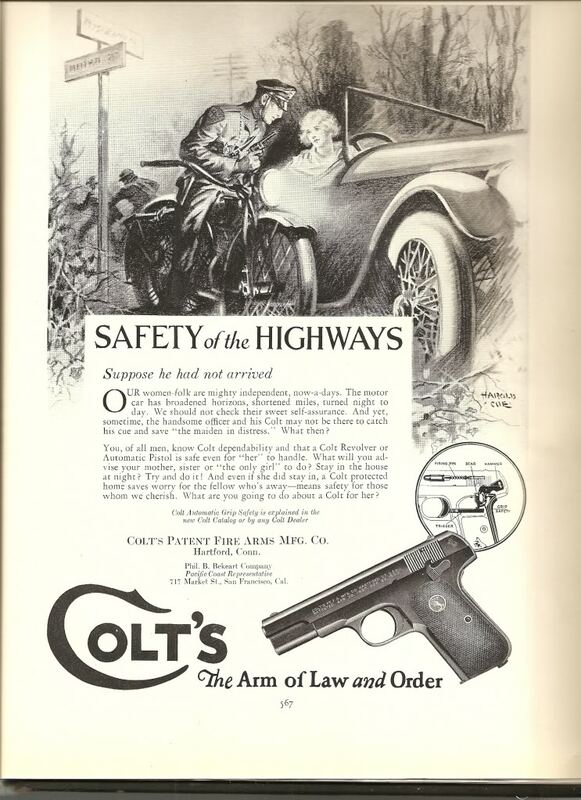 In the early 20th century, Colt’s Patent Fire Arms manufactured two John Moses Browning designed pistols, the 1908 Pocket Hammerless in .380 ACP (often called the “Model M”) and the 1908 Vest Pocket in .25 ACP (the “Model N”). As the names suggest, both were both made to be carried concealed in jacket, pants, or vest pockets. And they were both popular in their time. According to Massad Ayoob’s Greatest Handguns of the World, Colt’s produced nearly a million of these two concealed carry pistols by the 1940s (p. 128). 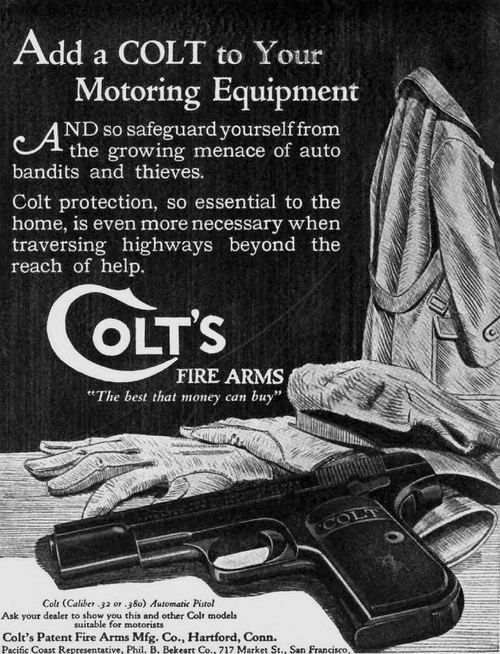 And still another highlights the fact that “women-folk are mighty independent now-a-days,” and that the motor car has played an important role in their “broadened horizons.” Since it is impossible for a man to keep women in the home at night (“Try and do it!”), the best thing he can do is to get a Colt handgun for her. Because advertising is both a “mirror” reflecting social practices and a “mold” influencing them, we should not be surprised to find people actually carrying guns in their cars for self-defense. Even prior to the shall issue concealed carry revolution, some states allowed people to carry concealed handguns in their cars without a permit (e.g., Louisiana). But one of the interesting things about the rise of Gun Culture 2.0 to me is that it allows some people to do legally something that they would otherwise do illegally. That is a big difference between Gun Culture 1.0 and Gun Culture 2.0. 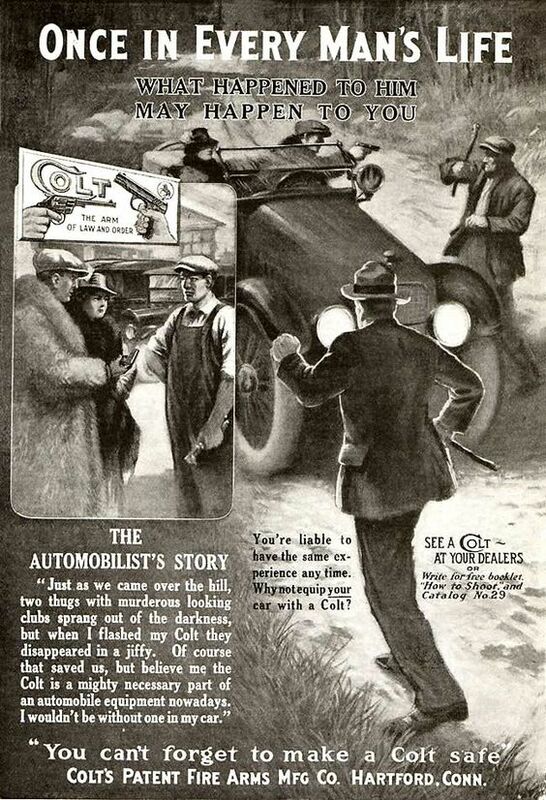 Tags: Advertising, cars, Colt firearms. Bookmark the permalink. There’s a book in assembling the various ads from various companies and correlating them with sales figures. Both in the US and Europe since there was little difference in controls in either until post-WWI.